When you’re looking for the best LED lights for planted tank, there’s one big thing to keep in mind. You’re not just looking for lights that will make your aquarium look pretty. The plants inside your aquarium depend on that light for survival. That said, you must also remember that too much light can cause problems, too. There are a lot of factors that go into deciding what LED lights are the best for planted tanks. How to Choose the Best LED Lights for Planted Tank? What is the Best Light for a Planted Tank? In order to choose the best planted tank lighting, it’s important to keep a few factors in mind. First, make sure that you’re getting a reliable product. One way to do this is to make sure you choose a well-known brand with a good reputation. Good LED lights will be consistent and put out the same amount of light over time. Pick LED lights that are durable and will last. It’s also a good idea to keep in mind how difficult the LED lights are to install so you can choose one that isn’t unnecessarily complicated. In order to make sure your plants are getting enough light, pay attention to the light spectrum. This refers to the colors of the spectrum that are actually present in the light. The broader the spectrum, the better the light will be for your plants because it will promote more efficient photosynthesis. The Kelvin rating or lumen is another thing to keep in mind to determine the temperature of the light and how it will affect your plants. Look for LED lights with 6500 to 7000K. Speaking of light, you can find some models that allow you to control the settings to make it look like various times of day inside your aquarium. This is a purely cosmetic feature that can give the room a different look depending on whether it’s morning or night. If you decide this is something you want, make sure to find LED lights with settings that are easy to control. You don’t want to spend too much time looking for the right combination. Cycles are also important to make sure that your plants aren’t getting too much light. If the LED light you use has a preset day/night cycle or an automatic timer, this will make it a little easier to make sure you’re giving your plants just the right amount. From a more practical perspective, make sure that your LED lights have good ventilation. All lights produce heat and it’s important that it can dissipate properly. A splash guard is also another feature to keep the lights safe from being too close to the water. The Finnex Planted+ 24/7 Aquarium LED gives you a lot of control over the look of your tank. There’s a fully automated day/night cycle that takes your tank from sunrise to sunset. You’ll get a gentle warm light when the sun’s coming up, bright midday light, and a reddened sunset that fades to a starry dark blue night sky. That’s not all. Using the included remote control, you can choose various natural events including thunderstorms and full moon light. This is a great choice for your plants, too. The light spectrum includes red, blue, and green LEDs plus has 7000K day time lights so you can be sure there’s enough light for you tank to thrive. 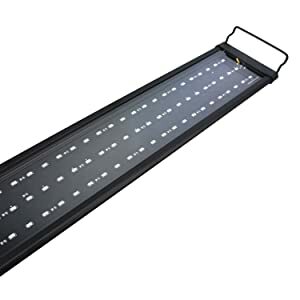 These LED lights can be adjusted to fit into tall and short aquariums and you can purchase them in five different sizes, ranging from 20-48 inches. If the rim of your aquarium is wide, these lights have a removable insert to fit better. They’re made of sturdy aluminum and have a water resistant splash guard. These LED lights will truly fit tanks of all sizes and will last a long time. This design from Finnex features LEDs that are perfectly spaced for refugium lighting or any tank that needs low to medium light. There’s a separate setting for moonlight if you want to create some ambiance in your tank at nighttime. All the newer Finnex models, including this FugeRay Planted+, feature true red LEDs that provide a much warmer glow to your tank. More importantly, though, this kind of red light has been proven to be one of the kinds of light that is most efficient for effective photosynthesis. The blue LED lights add to the look by creating a moonlight feature. 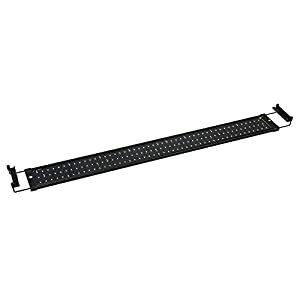 Although these LED lights are slim and somewhat compact, they spread 120 degrees which cover a lot of surface area. The high output LED bulbs are made to last a long time – at least 40,000 hours. The PC Splash Guard keeps the lights away from the water to protect them from damage and to ensure they’ll last a long time. Aluminum is used in the circuit boards to ensure durability and to keep the bar lightweight. This LED light is also made to allow cooling and proper heat distribution. If you’re looking for an LED light designed for promoting marine and freshwater growth, look no further than the Ray2 by Finnex. The bulbs are two strips of 7000K, bright enough to make sure your plant life gets just what it needs to thrive. The fixture itself regulates its own heat distribution so there’s never any need to worry about anything getting overheated. The circuit boards are made of high-quality aluminum so they’re lightweight, durable, and will last a long time. The LED bulbs are designed to last more than 40,000 hours and the PC Splash Guard helps protect the lights from any water damage. It’s also designed with a leg fixture that allows it to be installed on tanks of various heights. It’s also available in a range of sizes from 16 to 48 inches so no matter how large your aquarium is, you’ll be able to find one that suits your needs perfectly. While this model from AE-SHOP doesn’t have as many features and options as some of the others in our “best of” list, it’s still extremely impressive. If you’re not really into mood lighting for your tank and want something nice and simple, this is a great one for you. The 159 LEDs come in only white and blue colors, perfect to recreate a bright sunny day and a shimmery, starry night. It’s appropriate for saltwater or freshwater aquarium. This is a hood that covers your tank from end to end. One thing to mention is that it is not waterproof and there isn’t any kind of splash guard. While some of the other models hang inside the tent and are close to the water, this one sits higher and so splashing shouldn’t really be an issue. Just take caution not to splash it when doing maintenance in your tank. The brackets are adjustable and can fit a wide range of tanks and it’s available in a wide range of different models and sizes, too. One of the things that make this Beamswork system so popular is how well the lights are distributed. 174 LEDs perfectly positioned to provide the right about of illumination. The 6500K lights keep your plants healthy and thriving during the day. At night, the blue LEDs give enough ambient light so your fish are happy and your tank looks beautiful. These lights are designed to last for years and the splash guard helps keep them protected so they do just that. You can set the programmable timer so this system can be entirely hands-off if you choose to do it that way. No need to mess around with different buttons and settings. Set it once and sit back and enjoy your tank. 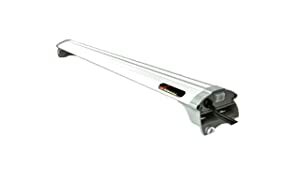 You can get this LED light in various lengths and each has adjustable brackets so you’re sure to be able to find one that is the perfect length for your tank, no matter how large or small it is. This LED light from Nicrew is a great choice for a basic freshwater tank. There are two different lighting modes. Lunar, which features 24 blue LED lights that give off an energy efficient glow that replicates the moonlight. And Daylight, which adds the brightness of 120 white LEDs for a sunny daytime look. The daytime lights are 6000K, a little lower than the recommended range but this light is surprisingly bright. It can sustain limited plant life. There’s no remote or fancy settings, all of the lighting is controlled with a simple switch on the unit. This also means that there’s no automatic shut off, so make sure you don’t leave it on too long to avoid the excess heat. The mounting legs are adjustable to fit a wide range of aquariums. They also make it easy to add multiple units if you want to. The ends are equipped with clamps so you can make sure they stay in place as they’re supposed to. Unlike the other models in our list, this one is designed to be used over an acrylic top or glass cover. Because it’s meant to be used at some distance above the water, it’s not waterproof and should always be placed over some sort of tank cover. This LED light was specifically designed for freshwater tanks and comes with a lot of customization options. There’s a 24-hour timer that even provides a 15-minute ramp up to simulate the sunrise and a ramp down for sunset. The light spectrum was made to help plants flourish, with brightness and shimmer that will make your aquarium look pretty incredible. You can adjust the intensity of the day and moonlight effects to your liking. You can even choose special settings that include cloud cover, storms, and even lightning. 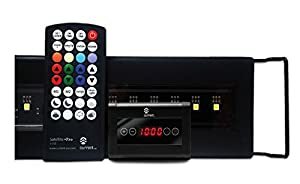 Programming can be done with either the included remote control or on the touch pad. The white LEDs have 6500K, enough to give your plants the light they need for effective photosynthesis. The unit in itself is very thin and lightweight, made of sleek, durable aluminum. The lights are angled at 120 degrees so you get good coverage over your whole aquarium. 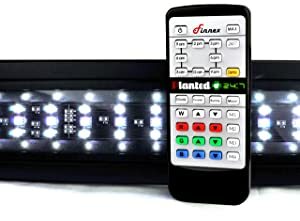 The Finnex Planted+ 24/7 Fully Automated Aquarium LED has a bit of an advantage over the other models on our list. The fully automated day to night cycle simulates a gentle sunrise, reddened sunset, and all the various stages of the day in between. You can also add some natural events to your effects, like a thunderstorm or a full moon. This all creates a nurturing environment for your plants, a cozy place for your fish, and a beautiful tank for you. Because the light spectrum contains red, blue, and green LEDs, it provides a wide range for your plants. Plus, the 7000K provides the perfect amount of fuel for photosynthesis. 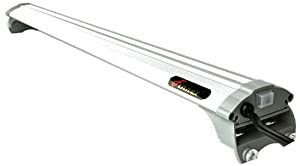 This LED light is adjustable for short and tall tanks and comes in a wide range of lengths, from 20-48 inches. If your tank has a fatter rim than most, this light has a removable insert that makes it pretty universal. Not only can this fit just about any tank, it has a water resistant splash guard to protect it from damage and is made of lightweight and durable aluminum. 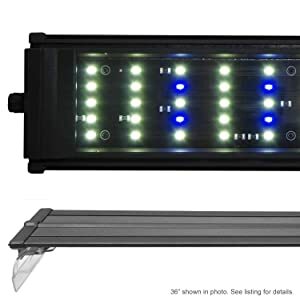 Between all the awesome features this LED light has and the fact that is was built to last, you can see why this would be considered the best led planted aquarium light. How many lumens for a planted aquarium? Lumens are more important for what you see than what your plants need. This is mostly because, while a lumen tells you how bright the light will appear to the human eye, we see different light than what plants need. Plants thrive on red and blue light so you have to make sure you’re providing enough to give them what they need. For a rough guide, consider trying 5 to 10 lumens per gallon. How much light is required for aquarium plants? It depends. Light is the single most important factor when you’re growing plants in your aquarium. The reason is simple – plants need light to grow. Lumens are a measurement of light and how much light you need depends on a number of factors. Two of the biggest things to consider are: What kind of plants are you growing? How large is your aquarium? As far as what plants you’re growing, you should know what their light requirement is. Some plants need a lot of light, some don’t. One thing to keep in mind is that plants requiring a lot of light are often more difficult to grow. So many factors have to be just right for these kinds of plants to flourish. You’ll have to consider more than light and pay closer attention to any changes in the water, maintaining and pruning the new growth, and how to or even if you should use fertilizer. At the same time, too much light can also breed too much algae. Low light plants tend to be a little easier to grow just because there’s less to worry about. How many hours of light for aquarium plants? This is actually really important and the reason that so many of the better LED lights have been designed with a 24-hour cycle. Aquarium plants should get light anywhere from 8 to 12 hours a day, which makes a lot of sense if you think about it. In nature, these plants are only getting light when the sun is up, not 24 hours around the clock. If you find that your tank is growing too much algae, it could be a sign that there is too much light. You can change this by using less light for the same amount of time or by shortening the amount of time that the lights are left on for about 8 hours. These are all reasons why having an LED light with a preset or programmable cycle make things a little easier. You won’t need to worry about whether or not you forgot to turn the light off or if you’re helping breed more algae. Automatic cycles and times take care of these things for you. There are a few exceptions. When you introduce new plants, leave the light on for a little longer to give them time to take hold and flourish. Stop and go back to a more normal schedule if you see algae appearing. You might also think about leaving the lights on a little longer in the winter because there will be much less natural light available. As you can see, choosing the best LED lights for a planted aquarium is really important. The right light is more than a way to make your tank look nice. It’s the most important aspect of having thriving plant life. While you may not prefer something with preset cycles and timers, in the end, these really will make it easier on you when it comes to maintenance. These features are the best way to make sure that your plants are getting the right amount of light because they follow a more natural cycle. Your plants basically get a simulation of the kind of day they’d have if they were growing in the wild and truly depending on the sunlight. Still, if you prefer to have more control for whatever reason, there are plenty of great choices available. Just make sure you pay close attention to the length of time you leave the light on so your plants can thrive in algae free environment. Your plants (and fish!) will be happy and you’ll end up with a beautiful tank to look at and enjoy.